johnelkington.com - influences - people - battle of britain. Sample of original Greg Becker illustration in The Guardian. "Thanks to Berry, who was in fact a Flight Sergeant, I just made landfall at West Wittering, which was within three miles of where the aircraft landed, not 60." "Second, your point about decimation. It spurred me to do some research. In fact, we only lost seven pilots killed during the Battle. Yes, in general the losses in the month were very high, but No. 1 was pulled back to Wittering on 9 September, before the worst occurred. If I showed you the list of squadron casualties in my book, that included all of those of that time who were eventually killed. And the number was boosted in my listing with three names which I cannot find on the Roll of Honour." Well, I stand corrected. The only point I would make in my defence is that the original meaning of decimation, as used when Roman legions were punished, was the death of 1 in 10 legion members. Another fifty years will see many more billions living in the world. John Elkington on priorities for the future. As the world changes around us, so do the ways in which we interpret even such well-established symbols as the White Cliffs of Dover. With the Battle of Britain very much in the public eye [this was the 50th anniversary year], consider some of the ways in which the developing Battle for the Planet will force us to view our world in a different light. But, first, a story. Fifty years ago, in the wake of Dunkirk, the White Cliffs symbolised a proud island nation waiting for the full onslaught of Hitler's airborne legions. Soon, the skies over southern England were crosshatched with vapour trails as "The Few" confronted the might of the world's deadliest war machine. As the dog-fights howled back and forth overhead, farm-workers reported finding rabbits bolt upright on their back legs on the chalk hills, paralysed with terror. At the time, my father - Tim Elkington - was a 19-year-old pilot with No. 1 Squadron. A fighter pilot's average life expectancy was 87 flying hours and a fair number died before they even had time to unpack their kit-bags. Nonetheless, on August 12, Tim claimed an Me. 109. 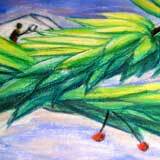 On the 15th, he also painted a mythical animal on his Hurricane's cowling for good luck. The next day he was "Top Weaver", flying back and forth over the rest of the squadron to provide an early warning of enemy fighters, when they encountered 100 German aircraft. In the ensuing melée, he never saw the aircraft that riddled his plane with cannon shells - although, amazingly, his mother did. From nearby Hayling Island and quite unaware that her son was involved, she watched the lone Hurricane pursued by three Me. 109s. Tim's fuel tank exploded, peppering him with shrapnel. Perhaps not what most people would think of as good luck. Yet his luck did hold. Unconscious as he drifted seawards in his parachute, he would certainly have drowned. Then his flight leader, Sergeant Berry*, achieved the extraordinary feat of blowing him back over land with his aircraft's slipstream. He was lucky in another way, too. On August 18, the RAF was put through the mincer on its "hardest day", losing 136 planes. While he was in hospital and convalescing, No. 1 Squadron was decimated. Flt Sergeant Berry plunged to the ground on September 1, before Tim could even thank him. For Tim, who had also been fired on by the Home Guard as he came down in his chute, the main legacy of the incident, apart from cannon shell wounds in his legs, was the shrapnel still in his body. For years afterwards it worked rather like a barometer, warning of impending changes in the weather. Everyone forgot about his abandoned Hurricane, which banking inland, flew on for more than 60 miles before crashing near Tonbridge. But in 1975, the Wealden Aviation Archaeological Group found the plane's Merlin engine, armour plate and cockpit controls deep beneath the Kentish soil. Now the chalk layers beneath such soils are yielding important clues about events much further back in the planet's history which could help us respond to what looks set to become an even greater threat to our future than the Luftwaffe posed in 1940. The White Cliffs of Dover, it turns out, are part of what is known as the Upper Chalk. Laid down during the Cretaceous Period, beginning some 130 million years ago, the chalk formed from the skeletons of tiny marine organisms in warm, shallow seas, taking massive quantities of carbon dioxide out of circulation. The rate at which the carbon dioxide was sponged up offers vital clues on the way our atmosphere and climate have evolved. I haven't asked my father whether his shrapnel is sensitive to impending climate changes but global warming - caused by "greenhouse gases" like carbon dioxide - is rising inexorably towards the top of the political agenda. Indeed, so great is the potential threat that future historians may well look at these early years of environmentalism and be tempted to repeat Winston Churchill's words of August 20, 1940: "Never in the field of human conflict was so much owed by so many to so few." The parallels between the Battle of Britain and the developing Battle for the Planet can be stretched too far, but are certainly striking. Like Churchill himself, environmentalists were fighting the battle long before the rest of the world had woken up to the threat. As with the RAF in 1940, their numbers have been relatively small, their ranks made up of highly motivated people drawn from every walk of life. But they have grown used to flying by the seat of their pants - and their impact has been out of all proportion both to their inadequate numbers and resources. They have been our Top Weavers, warning of risks such as ozone depletion and global warming at a time when some recently greened politicians still viewed environmentalists as the enemy within. Thanks to those early warnings, ordinary people are waking up to the fact that we have all been unwittingly fighting - and winning - a war against the Earth itself. Now the world's population is forecast to increase by another billion in the 1990s alone. Already under massive strain with the burden of over five billion people, the planet will have to cope with perhaps twice that number by the time we celebrate the centenary of the Battle of Britain. But there are more signs of hope than there were in 1940, or even 20 years ago when campaigning groups like Friends of the Earth were launched. For one thing, the threat to our global environment is helping heal old enmities. Ironically, many years after the war, my father met - and very much liked - the German who had shot him down. Now not only are we joining a reunited Germany in a larger Europe but NATO is saying that Russia is no longer the common enemy - and that environmental destruction is. As the superpowers begin to throttle back their war machines, there may be a "peace dividend" to spend at a time when world leaders are waking up to the need to invest in environmental security. Russia has already asked for environmental aid. The international environmental movement, meanwhile, is only just getting into its stride. Our recent GreenWorld survey, covering over 30 countries, shows the movement to be in a surprisingly buoyant mood. Having struggled for years to get their organisations and campaigns airborne, they are now confident that environmentalism will become the most important political, social and economic movement globally by the year 2000. The key factor that will drive the process is the dawning recognition that we live in a greenhouse world. Given that the carbon dioxide trapped in an inch or two of the 1,000 ft deep Upper Chalk layer is equivalent to all of the carbon dioxide in today's atmosphere, I suspect that my own children's generation will come to think of the White Cliffs very differently - as a symbol of the global carbon cycle which we are now disrupting with our profligate fossil fuel burning and tropical deforestation. 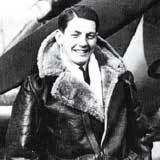 * According to Kenneth Wynn's book Men of the Battle of Britain, Frederick George Berry was born in 1914, joined the RAF in 1929 and had won a DFM for shooting down an He 111 over St Nazaire in 1940. Not long after he saved Tim, he was shot down and killed in September 1 1940 and is buried in Pinner New Cemetery, Harrow, Middlesex. ** I also remember as a child seeing black, oxidised bits of shrapnel popping out of Tim's skin after a hot bath. Published in The Guardian Weekend, 21-22 July 1990.